Elliot Fuimaono – Capital Blues Inc.
You’ll often see Elliot Fuimaono on bass at the Bristol, leaning back with eyes slightly closed, behind Darren Watson, Dave Murphy, or the Kemptones. His baselines have anchored many a jam night and special show, and he has recorded with Darren Watson, Brannigan Kaa, and Carol Bean. Recently I joined Elliot for a quiet beer and a chat. In 1960 Elliot Fuimaono was born to Maori and Samoan parents in the King Country town of Taumarunui. His early life centred around family and church: first a mainly Maori church, then a Samoan church after his family moved to Wellington when he was 9. Music started with singing at church, and later playing on family instruments. He took up bass at his brother’s 21st. His brother was the usual bass player for the family band, but he didn’t want to do it on his birthday so Elliot filled in and has never stopped. He has been playing in family bands since 1975. They used to play open air Christian gigs at Pigeon Park on Sundays, then switched to playing covers, and later originals, as Taste of Bounty. After the death of dynamic Hendrix-inspired lead guitarist Roy Fuimaono, the band became Bounty, then New Shuz, playing mainly pubs, but also at Sweetwaters. Elliotte joined Brannigan Kaa’s Brown Street about the same time as Chicago Smokeshop was smoking stages all over New Zealand. The bands went to each other’s gigs, often playing at the Oaks and at Western Park jams. 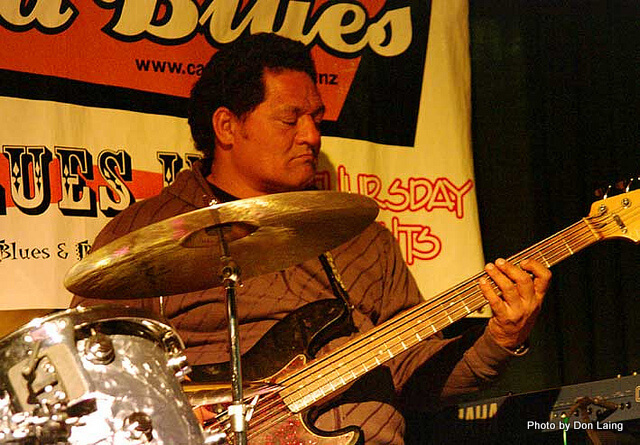 New Zealand bass players he likes include Brent Thompson, Max Stowers, Max Hohepa, Ryan Monga, Paul Dyne, and another familiar face at the Blues Club, George Barris. Previous Previous post: Creative and Intellectual Life at the Capital Blues Club!